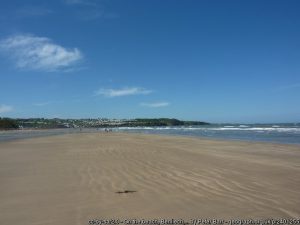 The award winning main beach at Benllech is a long stretch of rich golden sands, backed by cliffs. The name Benllech may have originated from the Welsh words ‘pen’ and ‘llech’ meaning ‘head’ and ‘rock’ – a reference to the sedimentary wave-cut platforms to the north. Benllech is a prime spot for long seaside walks where you can find unusual beach flowers. There is also a cliff path, from Benllech Isaf to the neighbouring village of Moelfre. A short walk around the headland at low tide brings you to Red Wharf Bay , where a small settlement looks out on a vast beach measuring 10 sq miles / 25.9 sq km at low tide. Here, there are excellent opportunities for bird watching, with waders and wildfowl in residence all year. In winter, walk through the woodland en route to Pentraeth, looking out for the elusive Woodcock. Alternatively, head north from Benllech to Traeth Bychan, a water sports centre with a slipway for launching boats.